Every year I head out skiing with some snowboarding pals for some high-adrenaline thrills coupled with binge drinking. It’s not always a pleasant combination and this year I took my fifteen year old brother with me so my drinking took a back seat. Not every day was eventful so here’s the first part, the London experience! Saved 50% off the Gatwick Hilton by using the hotel finder service just outside the south terminals arrival gate. Leaving the array of boards, bags and boots we nipped into central London on the Gatwick Express using the Express + One Day Travel card so we could roam the tube. And roam we did through Covent Garden, where the usual array of music, jugglers and artists were showcasing their talents, quickly through some back streets to The Snowboard Asylum and then into KFC in Leicester Square where we watched what appeared to be a 13 year old male thief get chased, captured and subsequently handed over to police by his intended victim. Ah justice and chicken, what a combo meal. We later ambled across the millennium bridge and practically ran round the Tate Modern with time was snapping at our heels. Jumping off at Hammersmith station we headed to Riverside Studios where I’d bagged us eleven tickets for a pilot TV show via Applause Store. 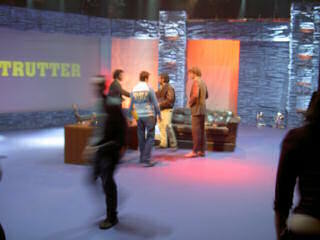 Titled simply Strutter and hosted by Mike Strutter, fictional creation of Paul Kaye – best known as Dennis Pennis, they show extreme clips of people doing stupid things broken up with comical adult banter and mock interviews. Mike is accompanied by Northern wild-haired shy-guy Tommy and an Essex girl slapper with some odd fetishes. I’d never seen a TV show recorded before and found it quite interesting. Surprising was how well these people deliver high-speed lines while in character and with very few mistakes. The actor playing Tommy didn’t break character once nor fluff a single line in two hours.